Samuel Richardson Jr was born 22 May 1646 to Samuel Sr and his wife Joanna Thake. Samuel's parents were from the town of Westmill in Hertfordshire, England and they arrived in Charlestown, Massachusetts Colony about 1636. From there the family removed to Woburn. 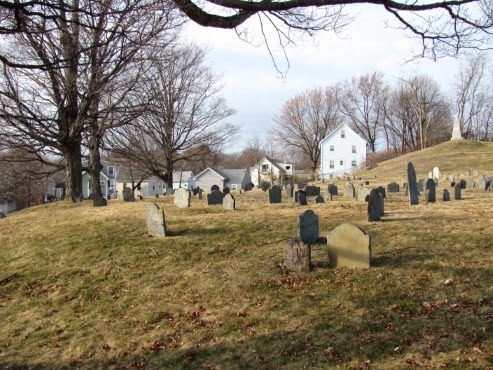 Along with two of Samuel Sr's brothers, Ezekiel and Thomas and four other men, they founded the town of Woburn. The area where they lived still has a street called Richardson's Row today. Samuel Jr. was born in Woburn where he grew up and married a woman by the name of Martha. Samuel's life in Woburn was to be far from tranquil. Martha died in 1673 giving birth to their fourth child, which included a pair of twins named Samuel and Thomas. But that was just the beginning of Samuel's woes. He remarried to Hannah Kingsley the following year and early in April 1676 she gave birth to a healthy daughter. One week later, on 10 April 1676, while Hannah nursed the newborn in bed, Samuel had his six-year-old son Samuel with him, carting manure to the fields. Suddenly they heard screams coming from the house, and saw feathers flying from the terrified fowl in the front yard. Samuel raced back with his boy to find his wife slaughtered in the bed. Their nurse who had been helping the new mother in her recovery from the recent birth had tried to save the infant, but had dropped her outside in her haste to get away. The pursuing Indians had dashed the baby's brains out. Dead too was little Samuel's twin brother Thomas, age 6. Samuel Richardson and a group of his neighbors went out to find the Indians who had massacred his family. They came upon a group of three Indians and there was a skirmish in which one of the Indians was killed and the other two fled. This horror took place against the backdrop of the King Philip's war, which had begun in June of 1675 and would continue until late summer of 1676. During this armed conflict between the local Native Americans and the English, in which our Samuel served, many colonists were attacked in such a manner and even whole villages were wiped out, the English inhabitants slaughtered or driven away. A dozen villages across Massachusetts and Rhode Island were thus eliminated before the killing ended after “King Philip”, or Metacomet, the leader of the Indian faction, was killed in August 1676. However, the war continued with ongoing raids occurring, mostly in what is now Maine, until a treaty was signed in April of 1678. The grievances of the Native American populations included the expansion of the English population along with the taking of more and more land. In addition, the Native American people had been ravaged by diseases brought by the English to which the Indians had no immunity. Finally, break-downs in diplomatic relations between the Indians and English, often having to do with alliances with rival tribes, contributed to the boiling over of the Native Americans' frustrations which led to attacks on the English and war. The King Philip's war is considered by many historians to be the deadliest war in American history. In the short space of sixteen months, twelve towns were obliterated, and over half of all New England towns were attacked, sending the colonial economy into a tailspin. The English population was decimated. Nearly a tenth of all military service aged men were lost. The best book and reference that I have so far read about this tragic series of events in American history is Flintlock and Tomahawk: New England in King Philip's War by Douglas Edward Leach. Samuel Richardson survived this sad episode in history and remarried two more times, fathering a total of fifteen children.